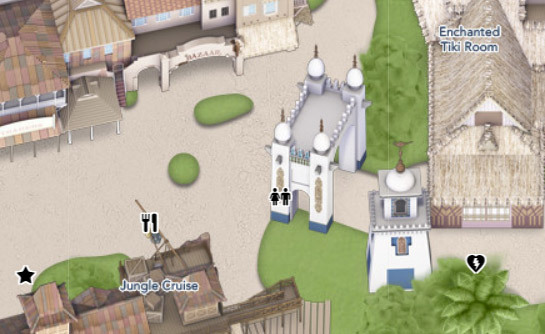 The pictures of Adventureland in Disneyland are split into six sections: Introduction to Adventureland and Tarzan's Treehouse, Jungle Cruise, Indiana Jones Adventure, Tiki Room, Aladdin's Oasis, The North Side, and the South Side of Adventureland. 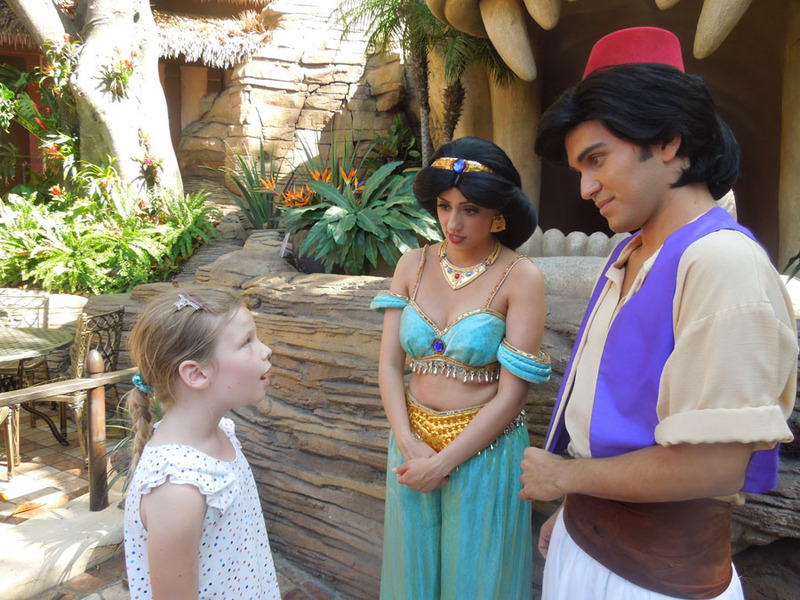 Aladdin's Oasis is a character greeting spot in Adventureland. 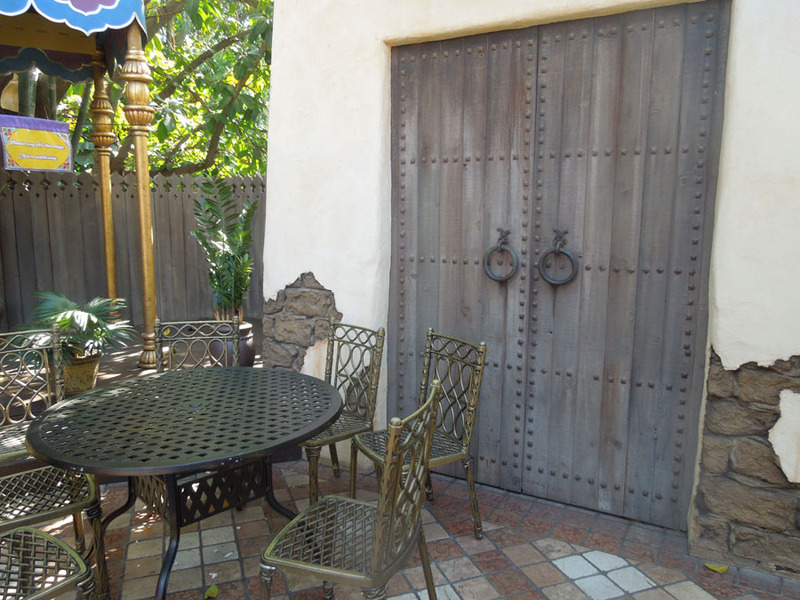 There is an ornate doorway into a lush, quiet getaway where guests can meet Jasmine and Aladdin. 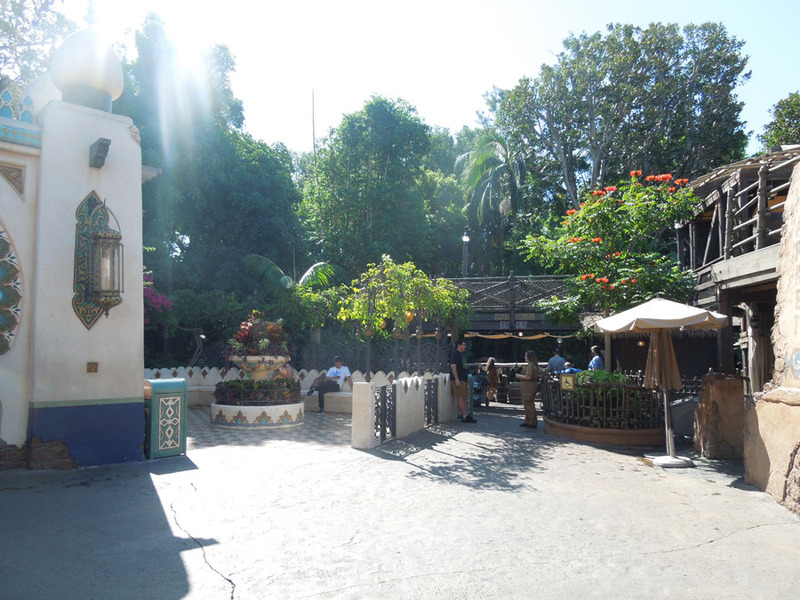 To the south of the round Oasis doorway is a small plaza lined with benches. It is a great place to rest, away from crowds but with a good view of them. 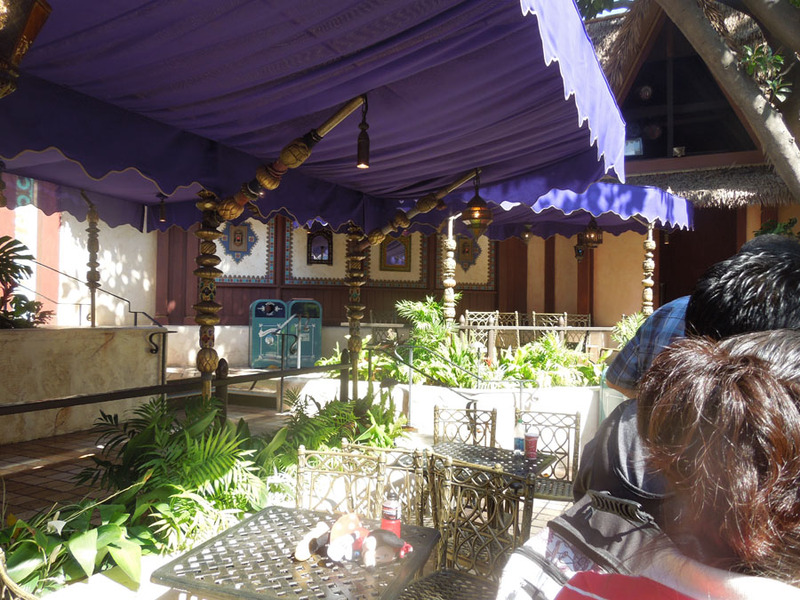 This photo shows the back of Aladdin's Oasis, the view from a Jungle Cruise boat. 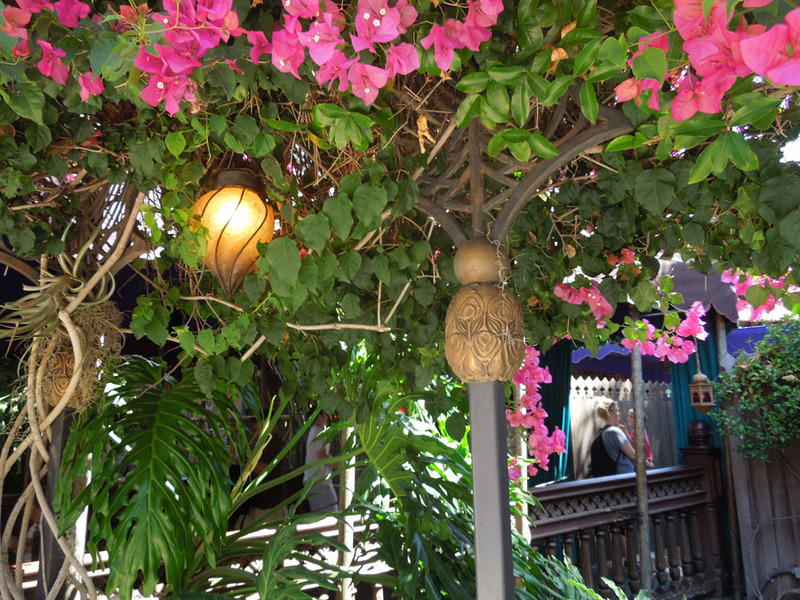 The path into the Oasis. 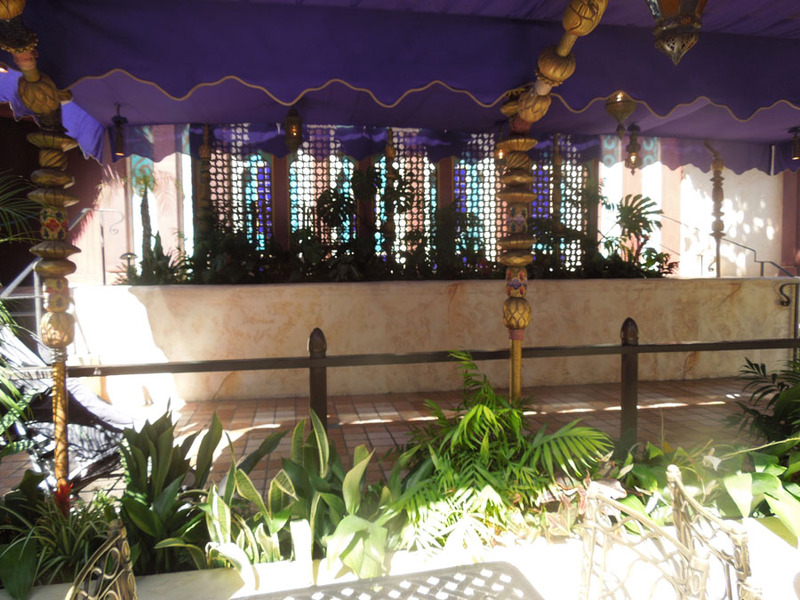 There are a few tables in the oasis. I believe food was served here at one time. 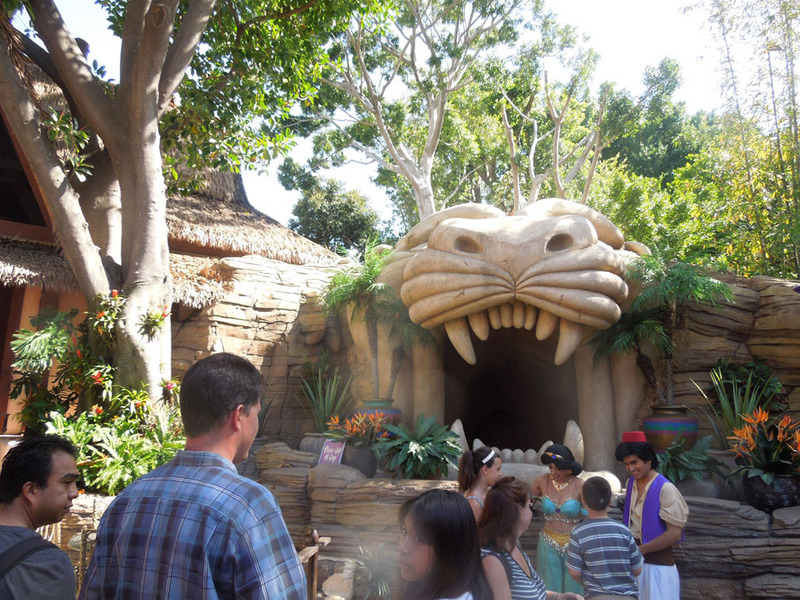 The tiger head in Aladdin's Oasis. 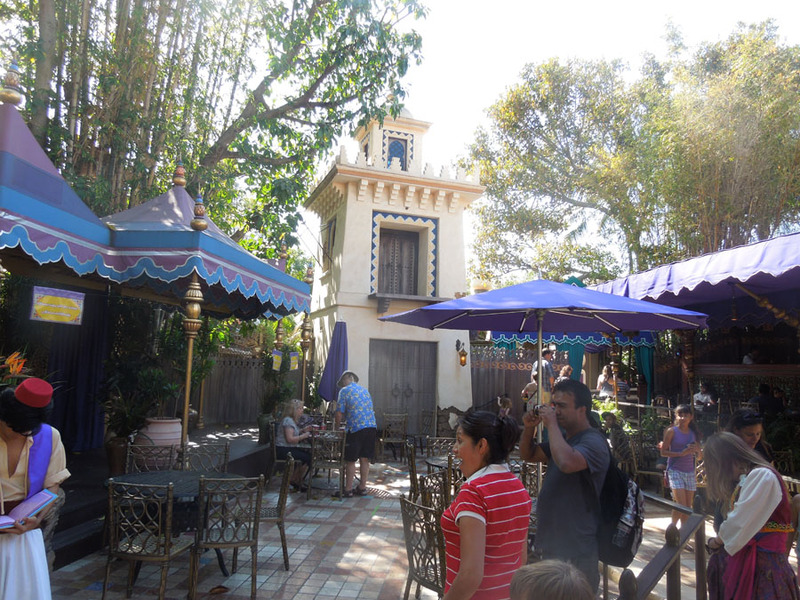 Looking at the tower from inside the Oasis. Check out those awnings. Doors to the tower. 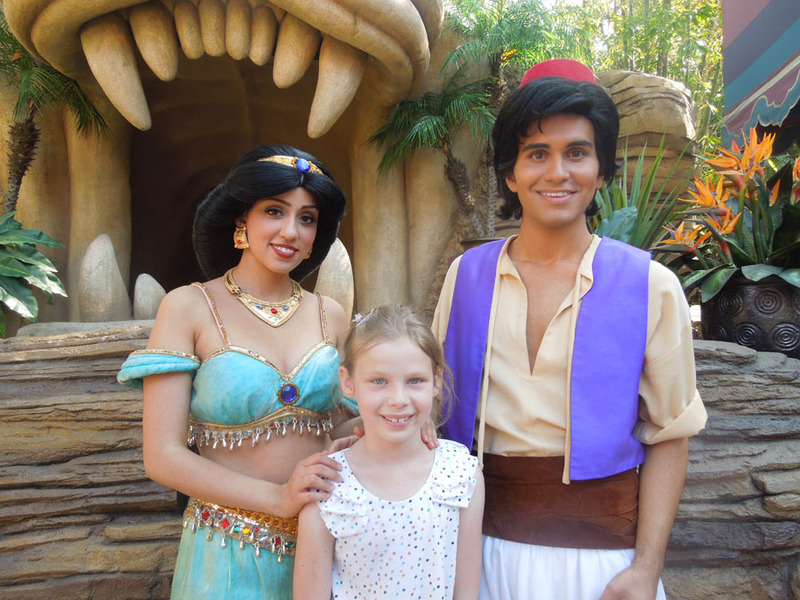 Jasmine might have entered through here in the past. The sign says "Please stay off the stage. Not a walkway"
A wider look at the Oasis. 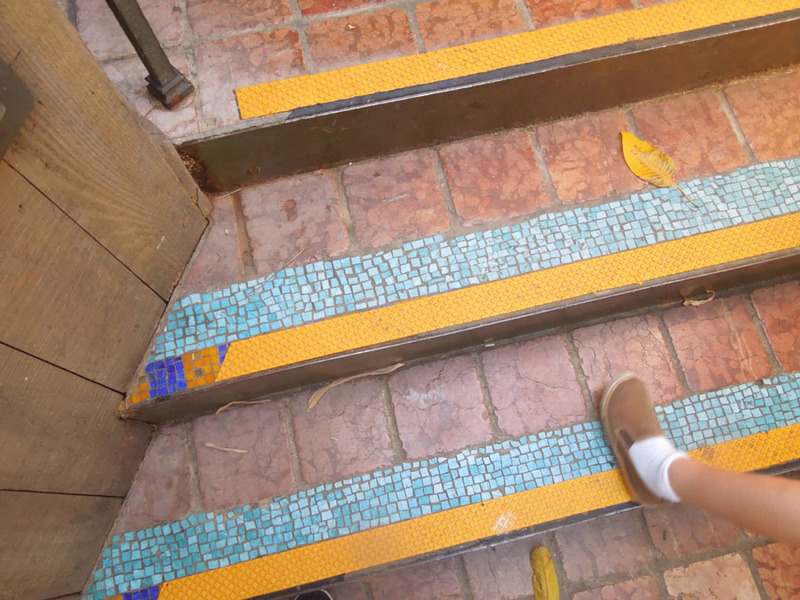 Some stunning mosiac work on these stairs, mostly covered with yellow texture strips. 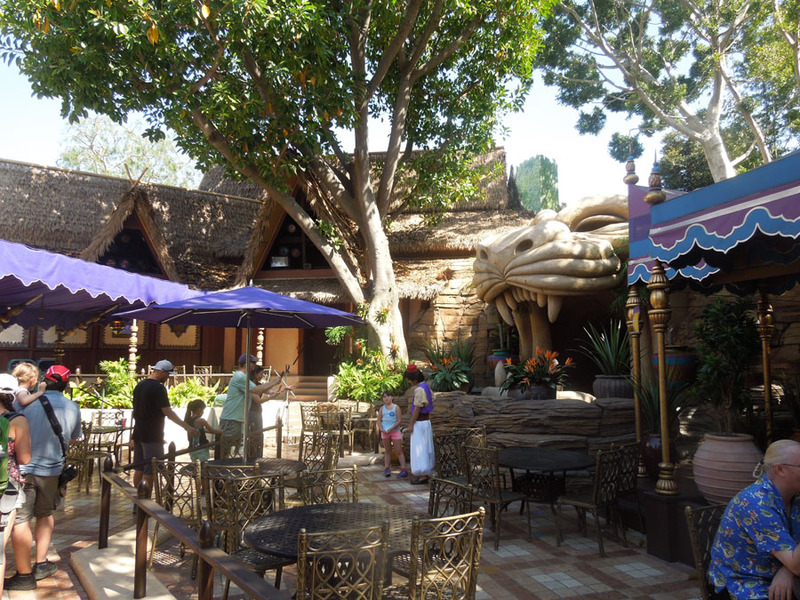 The pictures of Disneyland are split into six sections: Introduction to Adventureland and Tarzan's Treehouse, Jungle Cruise, Indiana Jones Adventure, Tiki Room, Aladdin's Oasis, The North Side, and the South Side of Adventureland. 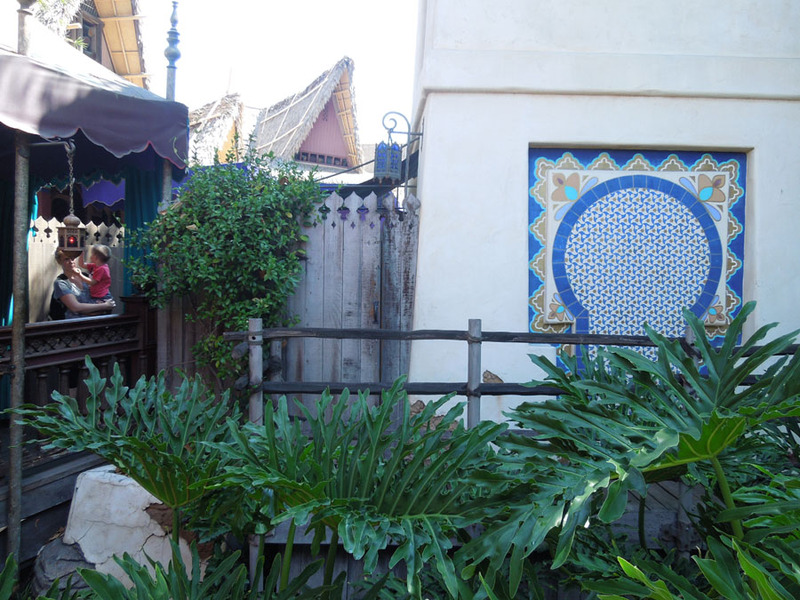 Other Disneyland Lands: Main Disneyland Map, Main Street, Tomorrowland, Fantasyland, Toon Town, Adventureland, Frontierland, New Orleans Square, Critter Country.